Some changes are afoot in the BananaOrangeApple store. I commissioned a lovely Sydney artist named Ruth-Mary to make me a new banner. That is the heading at the top of each shop page. I had already made a pretty dodgy banner myself using Paint. The one Ruth-Mary made for me is a watercolour, and I absolutely love it. You can have a look at her shop, here. It is called "Patchwork Family Art" because of the special composition of her family. Don't you just love it? So I turned her little fruit painting into business cards. 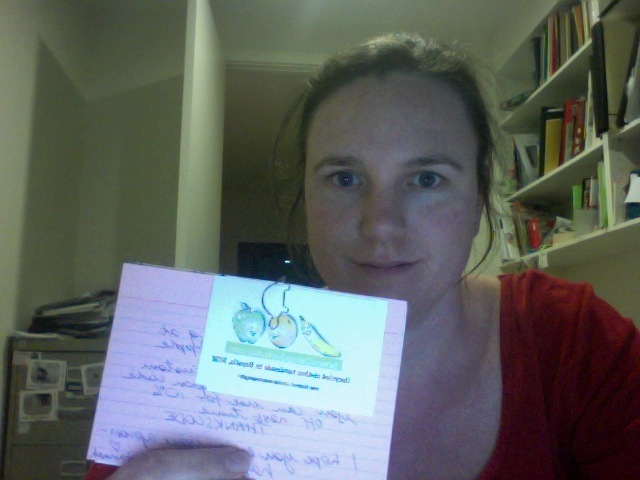 Here's me holding one with a little handwritten note that goes in to an order. I like to include a coupon code in case a buyer wants to come back and make another purchase, then they can get a little discount. I think repeat custom is great! Yes, that is a turtle paperclip, they did not have any fruit paperclips. I made the business cards using Publisher. After that I was feeling slightly clever so I made stickers with some Avery Labels I had bought for that purpose. 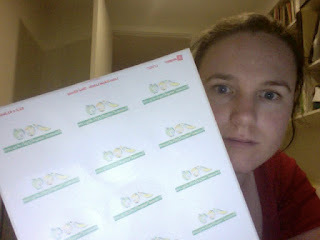 This took a bit more effort since I had to use the Avery.co.nz website to find the oval templates. But it worked out alright. 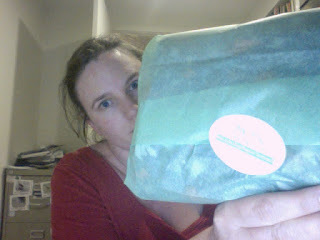 Here's a parcel wrapped up and ready to send. It is a vintage apron, you can check it out here if you are interested. This one is off to Seattle in the morning. 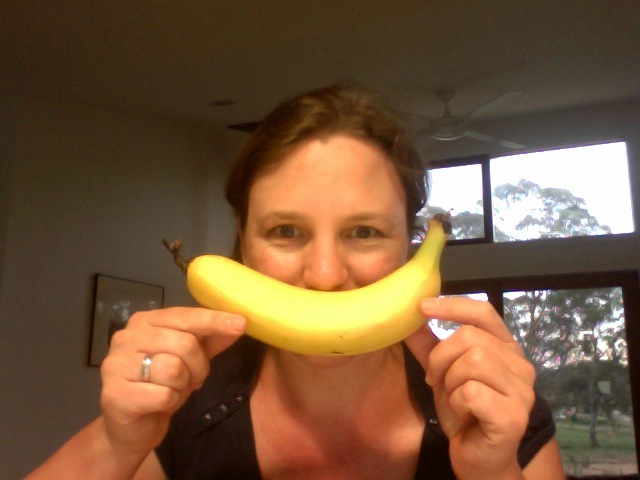 Here's me being silly with a banana-smile. I would like to put these on the back of my business cards so tech-savvy folks can get a link to my shop straight away. Now, I know my business cards and stickers don't really show up all that well in my photos on the blog but let me know if you'd like me to send you one, I would love them to go out into the wide blue yonder. Thanks for reading, comments and questions are very welcome. Bless you. I just started adding a coupon with my sales. My customer just received their package, and sent me an email about making another purchase. You are doing a great job in packaging. Your labels turned out great! haha, I loved your photos here! and I LOVE your new graphic!!!! I like to wrap mine up too and you have inspired me to get some stickers printed! Great idea to put stickers on the package! 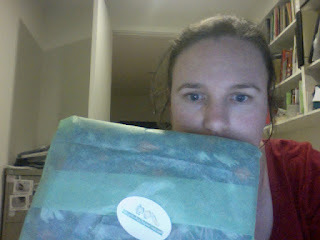 I have been putting a business card in with my wrapped items but the sticker is a nice extra touch! I love your new logo too! so cute! Love that you made stickers. You've inspired me to make stickers!!! The logo is really beautiful, looks great. Wow! You have really inspired me to take a new look at my shop and way of doing business. Your logo is great! So impressed with the QR code... How did you do it? Thanks for mentioning my little shop :-) It was fun doing your banner painting!